Now the big question is what we in Wales should make of it. I've been following the process, and my view is that it's at the bottom end of expectations. Calman was set up by the three Unionist parties in Scotland because they realized that the current devolution settlement in Scotland needed to be extended. They had to reach an agreed compromise on further devolved responsibilities because, if they didn't, the Scots would be more inclined to think that independence was the only other way forward, therefore support for independence would grow. As for the details, the headline is that Scotland will have it's block grant cut by an amount equivalent to 10p of Income Tax, meaning that it will have to set a rate of Income Tax (of whatever it chooses) to make up for the loss of that part of the block grant. So although this has been trumpeted as Scotland getting to keep half the income tax its people pay to Westminster, this is not really the case. And, as I think it is also fairly certain that tax rates will have to rise in future to pay for the UK's huge amount of recent borrowing, the "10p formula" will shift even more in Westminster's favour. If there was one amendment that I would fight to change (as a logical and reasonable compromise that the Unionist parties would find it difficult to refuse) it would be that taxes in all bands are equally split. As Alex Salmond said more eloquently than I could, having power to vary only one main tax hardly constitutes any degree of control over the economy. What matters is the balance of taxes ... so that you can maintain a chosen level of expenditure from a range of sources. But more importantly, taxation could and should be used as a way of developing the economy. Given a choice of which taxes we would most like to control, nearly every financial expert in Plaid would aim for control of business taxes. The general idea would be to lower business taxes to make Wales a more favourable place to do business. That brings more jobs to Wales and, as a direct consequence, increases the tax take because more people are in work, and decreases the amount we have to pay in benefits for those who are out of work. If we get the balance right, the amount the Welsh government loses by reducing business taxes is more than made up for by the increased personal tax take (the number of people paying tax goes up, but the rate of tax remains the same) and the need for social security payments goes down. By that standard Calman is huge wasted opportunity. But, nonetheless it is a small step towards greater fiscal autonomy ... and a small step is better than nothing. In practical terms I imagine the SNP and Liberals will use this to press ahead with their plan for replacing Council Tax in Scotland with local income tax. The sums didn't quite add up when only 3p was available, but will add up now. As for other matters, what struck me was the micro-management of areas which could be released from Westminster's control. Instead of any broad policy areas, there were only half a dozen or so little things. This leads me to guess that Calman wants to do the same job over and over again every time another half dozen things get put onto the political agenda. This report is not designed to be a far-reaching, comprehensive settlement. It smacks of short-termism. It should also be noted that Calman wants to take some matters back from Holyrood's control to Westminster. The areas suggested include charities, food labelling, heath professionals and insolvencies. Almost laughable was the Commission's response to calls for broadcasting to be devolved to Holyrood. This was something that the Commission had originally indicated it was prepared to countenance, but has now shied away from. The compromise is that the Scottish Government should be able to nominate one member of the BBC's board of trustees. Wow, that'll make a difference! But Scotland at least has programmes like their own version of Newsnight, which normally occupies the last 15 minutes of the slot. Wouldn't it be good if the BBC were to give us the same in Wales? Should Scottish Ministers be Able to Borrow? There was a boom period in the early 80s when tax peaked at £28bn a year. But at the start of the 90s it was down to about £2bn and has tended to go upwards since then, fluctuating between £7bn and £12bn in the last five years. What has changed over time is the balance of taxes. 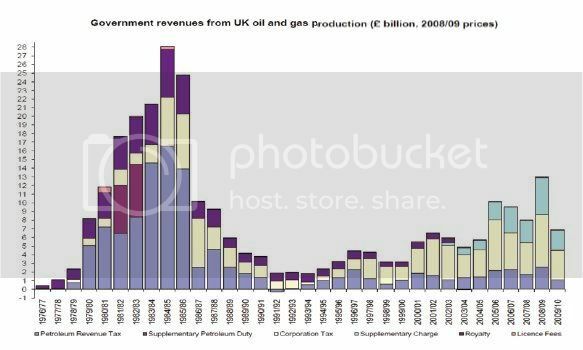 Petroleum Revenue Tax is now minimal, with the huge bulk of revenue coming from normal Corporation Tax at 30%, and a special "supplementary charge" which is in effect another 20% rate of Corporation Tax. Bearing in mind what I said before about control of business taxes being more useful than control of income tax, I would have thought it right that Scotland should control the rate of Corporation Tax on all businesses, including those operating in its waters. But there is a silver lining for Wales in this. If I were Scottish I would still be livid at the UK continuing to claim all the tax money from the Scottish part of the North Sea as "British". But the precedent that has now been set (since Gordon Brown seems certain to implement the bulk of the Calman recommendations) will in fact work just as well for Wales as it does for Scotland, because it is not complicated by the issue of North Sea oil and gas. The measure of fiscal autonomy proposed for Scotland is so limited that there would be no real problem applying exactly the same tax setting formula to Wales as well. Our own Holtham Commission is due to report its Stage 1 findings and conclusions sometime in "summer 2009" ... so we shouldn't have long to wait. Any thoughts about what it might recommend? Good post, as ever I enjoy reading this blog, even on the bits I do not agree with. For a nationalist group so intent on forging things on their own, Welsh nationalists are so utterly dependant on looking at others. It should be said I see the devolutionary imbalance as a problem, but a problem that cannot now be solved by merely looking at countries solutions and ramming them into a Welsh context. The great shame of bringing devolution to Wales is that it forsaken the chance to avoid having to have another referendum on further powers. The next referendum is merely a joining up exercise, with the historical vote already taken place. However, anti-devolutionists can now run those of us who want more powers a merry jig by painting this as a hugely important vote. Anyway, I am not hugely au fait with what goes on in Scotland, to my shame it must be said. Essentially you are relatively safe political ground to sketch out the scenario whereby Wales altering taxation, particularly across a wider remit. However, it is wrong to suggest that taxation “could and should be used as a way of developing the economy”. Well, perhaps to put that better, I think you are over egging its importance by utilising symbolism to aid and abet the nationalist cause. Tax changes, particularly broad sweeping ones, of course can alter the economy, but their very real limits are apparent. For the record, I am not frightened or opposed to the notion of a federal britain or devolution max in Wales, a point that I am sure those seeking to decapitate me via the comments will have probably lost in the white spit in the corner of their mouths. I enjoy your contributions too, STH. You seem to think nationalism is insular. I would say we have a far broader view of the world than others. By looking at the rest of the world, we see how over-centralized the UK is. By looking at what your party does in relation to Scotland, we get some idea of what your party's attitude to Wales will be. Knowledge is power ... or at least it helps! "displace both capital and profits from other parts of the UK towards NI"
This was thought by Labour in Westminster to be a BAD thing. I would say it was a GOOD thing. It is precisely what is needed to counteract the over-centralization in the UK ... where the disparity between the richest and poorest parts is TWICE as great as it is in any other EU country. And as to Wales getting some of the same taxation powers as Scotland, Peter Hain said yesterday that all the Welsh Government has to do was ask. But yes, we do seem to be getting into a mess over referendums. In my opinion there was no particular need for a referendum on primary lawmaking powers. It could have been implemented simply as a way of correcting what was wrong with the previous settlement. But by making it into a "big thing" we give others the opportunity to say that every little change in future must be decided by another referendum. That's what some are now saying in Scotland over Calman; but what on earth is the point of a referendum if all four parties want what Calman has recommended? I believe that Peter Hain put the referendum in place in Wales as part of a plan to slow things down. To me, it is clear from every word he utters that his overall game plan is to say he wants more devolution (to make him seem like a nice, reasonable person) ... but to always add, "but not yet". At least Paul Murphy was honest about his position. I know that you want to see the Senedd have the same sort of powers as the Scottish Parliament, STH. So you have to make this clear to your party, and if that means putting Hain out to pasture, that is a bullet you have to bite. If you don't do it in the ten months you have left in power at Westminster, you cannot rely on the Tories to do it for you afterwards. We both have every reason to trust the Tories even less.